Just thought I'd share the reason why there isn't a card on my blog this morning :) We met up with another family of 5 and shared a lake-front-cottage for the weekend. It was loud and so much fun! trying to figure out where our friends are at! mmmm.... why can't we get this stuff in Canada?! all the kids, minus Maia. And yes, Liam is quite the little poser! the milk to my cookie. a cute little lovey card, just because. and a layer of shimmer, just for fun. You are the milk to my cookie. complete with milk and cookies. My little man, my 4 year old Thomas, will be dressing up for preschool today. He has been wearing his costume pretty much everyday this week, and it makes me smile. every. single. time. If you read the blog post title, you've probably already surmised that he will be dressing up as Zorro :) If I can catch him at a standstill sometime before Halloween, I promise to share a picture. I love the pants with the built-in-boots! hee hee! I used the bat and sentiment from paper smooches' "falling for you" set, the PTI gingham background set, and the hero arts ledger background stamp. You can even see the foam squares holding them together in this picture, on either side of the thread. I stamped the inside of the card with the ledger stamp for extra interest. CAS-ual Fridays - just add color! 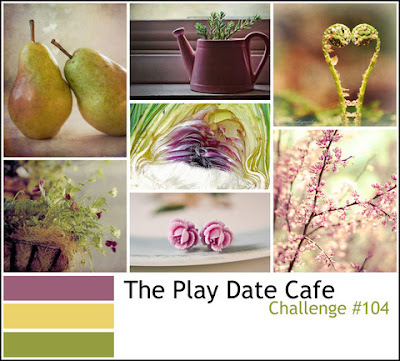 Adding color to stamped images, for the new CAS-ual Friday challenge. I stamped the acorns from paper smooches' "falling for you" and colored them in with copic markers. The circle frame around each acorn is from a PTI "tag its" set. PTI blog hop: fabric pumpkins. I'm seriously having to stop myself from taking that little mustache stamp and adding it to everything... I did, however, print up a picture of my hubby and stamp him with that little mustache... you know, just for fun... hee hee. I created my own faux-twine by taking a purple copic marker to a length of string, marking it at regular intervals. Nothing like the real thing, of course, but when you want something to match... it's a good solution! MIM #37 and a gift. This week's MIM challenge is to layer mats and create frames with different die-cuts. This cute onesie tag was layered with a mat stack 4 shape. Into the mat stack 4 shape, I die-cut the car from "enjoy the ride" before stamping its coordinating image into the opening. The sentiment is from lawn fawn's "admit one." I made the bag from a tutorial found here. I'm a complete beginner sewer, but I love how I can use my papercraft supplies in coordination with my fabric stash - so fun! and who doesn't love some itty bitty clothing? Pinstripe pants on a newborn? Yes, please! That's all for now - have a great weekend! A handmade Christmas, part 3. Have you been following my black-apple-doll journey? If you're just starting out, I've already made a doll for my son and one for my eldest daughter. The last one is for my bitty baby. I re-sized the martha stewart pattern yet again so she'd be a bit smaller than the others. She is, after all, the little sister. 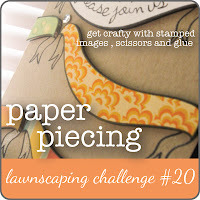 The new lawnscaping challenge is paper-piecing! I stamped the pig from lawn fawn's "critters on the farm" onto various patterned papers and cut them out and mounted them with foam squares. I created a focal point of pigs (!) by stacking them onto a strip of white cardstock and tucking half of a decorative label shape on either end. I glued that to a white mat, which I'd stamped with "schoolhouse backdrops" - also in pink, naturally! The sentiment was created with "smitty's abcs". A handmade Christmas, part 2. 100, and still got it! CAS-ual friday - feeling loopy!